Cover art for Black Lightning/Hong Kong Phooey. DC Comics’ ongoing line of Hanna-Barbera comics have led to some of the best (and at times, weirdest) comics around—but another delight has been the regular crossovers these characters get to have with DC universe mainstays. Another wave is on the way, which means that Aquaman is going to meet Jabberjaw, and I can’t wait. Announced through an extensive interview at CBR, the next four one-shot crossover comics will focus on Hanna-Barbera characters first introduced in the ‘70s. Hong Kong Phooey will star in a story from Bryan Hill, Denys Cowan, and Bill Sienkiewicz; Dynomutt in one from Peter J. Tomasi, Fernando Pasarin, and Oclair Albert; Jabberjaw in a third from Dan Abnett, Paul Pelletier, and Andrew Hennessey; and lastly Scott Lobdell, Brett Booth, and Norm Rapmund will handle a story starring Speed Buggy. Black Lightning/Hong Kong Phooey and Dynomutt/Super Sons. 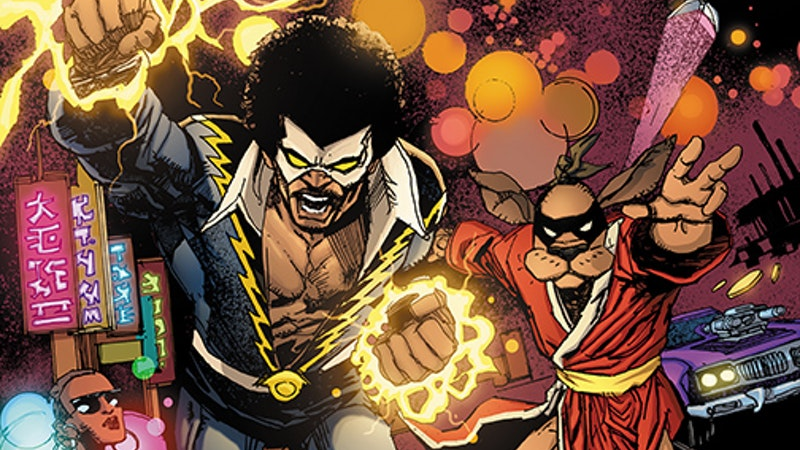 The DC counterparts each Hanna-Barbera star will be matched with are pretty obvious, yet still great: Phooey will be teaming up with the ‘70s incarnation of Black Lightning for a post-Vietnam mystical murder mystery. Dynomutt will team up with Damien Wayne and Jonathan Kent, the Super Sons, in order to save Dynomutt’s partner Blue Falcon from seemingly going rogue. Jabberjaw, meanwhile, turns to Aquaman when a new version of the Ocean Master turns Jabberjaw’s home into a dystopian nightmare, while Speed Buggy and Wally West’s Flash find themselves trapped in an apocalyptic future that apparently includes a Reverse Speed Buggy. Aquaman/Jabberjaw and The Flash/Speed Buggy. See? These books are always a damn hoot. And if anything, they sometimes contain hints as to where DC could potentially be taking a few of these cartoon characters in their own ongoing series, so they’re worth checking out. The four new DC/Hanna-Barbera one-shots will all be out May 30.